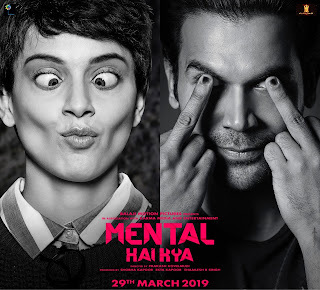 Ekta kapoor’s quirky, entertaining thriller ‘Mental Hai Kya’ will be releasing on 29th of March'19. Starring Kangana Ranaut and Rajkummar Rao, the film has piqued audience interests with the uncanny and whacky first looks. Mental Hai Kya will take the excitement to another level. Mental Hai Kya directed by Prakash Kovelamudi, produced by balaji motion pictures and karma media and entertainment, celebrates the imperfections and the crazy within us and shouts out ‘Sanity is overrated’. So gear up and get ready to go mental on 29th March 2019.